To support web access, unique identifiers such as Item Codes (Item Master Data) or Card Codes (Business Partners) must be “URL safe”. That is, they cannot include certain special characters. Note that B1 allows some URL-invalid characters to be used in Item/Card Codes within the SAP Business One client. To ensure web compatibility, data must be uniquely identified with URL-safe characters, as outlined below. Recommended best practice is to use alphanumeric and dash/underscore characters. If this is not possible, the list below identifies which special characters are supported for certain data types. Note that this limitation is not applied to data such as a customer’s name or item remarks. This limitation applies to the unique IDs used to access an object’s data. Supported for add-on object Codes? Private Browsing prevents sessions from being saved, which is core to how the Portals function. This user scenario is not supported for Customer Portal, Employee Portal or Vendor Portal. In the case where pricing decimal precision is greater than the currency’s precision, and where special pricing discounts result in totals that are outside of the currency’s precision, Order Pad will display a strike-through as if the amount is stale, even when pricing is current and accurate. In this case, orders may be placed, and this display issue will not affect pricing calculations, only the display of pricing. In simpler terms, overly-precise discounts may result in the false display of the “order is stale” strikethrough on Order Pad. Customer Portal Order Pad does not support Bill of Materials (BoM) Pricing. As a result, items that are a BoM cannot be priced and ordered using the Order Pad for Customer Portal. Individual components may be ordered using Order Pad, however the overall BoM pricing will not be applied. If changes are made to a website’s virtual directory url, any saved orders will become corrupt. The symptom of this corruption is that orders will appear to load, however they cannot be placed or updated. To prevent or correct this issue, if you plan to change the virtual directory assigned to Customer Portal, first delete all .odata files from the Customer Portal website’s /customerData/ folder, then apply the virtual directory update in IIS. This will delete any customer’s saved, in-progress orders but will not delete any submitted orders that have already been loaded to SAP Business One. Only saved, unsubmitted orders will be lost. 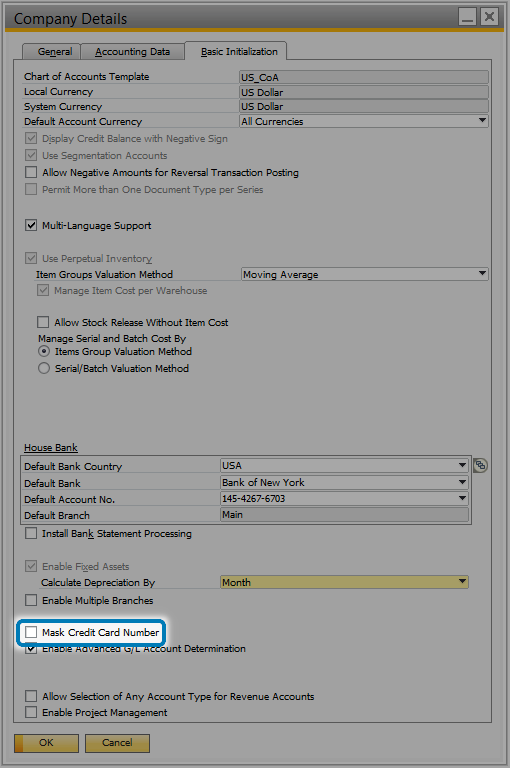 When the company setting Mask Credit Card Number is set (see screenshot below), this impacts Employee Portal Sales User by preventing Business Partner data from being edited. This is due to a limitation in the SAP DI-API encrypted credit card numbers. To ensure Sales Users have the ability to edit Business Partner data, ensure this field is not checked. Company Details setting: Mask Credit Card Number. For full-feature compatibility with Employee Portal, do not enable this option. Due to a change in the underlying code for customizations within Employee Portal, breaking code changes may occur in customizations that are upgraded from version 5.4 to a later version. To avoid down time, perform testing of customizations that have been in place for version 5.4 (or earlier) when upgrading to a more recent version. Specifically, test out any customizations to the basic flow for Sales User Order Pad functionality, and editing Business Partners with Sales User. Employee Portal Order Pad for Sales User does not support Bill of Materials (BoM) Pricing. As a result, items that are a BoM cannot be priced and ordered using the Order Pad for Employee Portal. Individual components may be ordered using Order Pad, however the overall BoM pricing will not be applied. MapQuest used within Employee Portal Sales User does not support localization. When viewing customer address maps within a Business Partner’s details screen, this will be displayed in the locale presented by MapQuest.